Survivor: Redemption Island (2011) - 4th place, 15th out - 9th juror. Voted out in Episode 14, "Seems Like A No-Brainer" (Day 38). Redemption Island Ep. 1 RC/IC: "Push It Uphill" - Competes, and Ometepe loses. Redemption Island Ep. 2 RC/IC: "Smash, Grab, Smash" - Retrieves keys for Ometepe, but again, Ometepe loses. Redemption Island Ep. 3 RC/IC: "Spin Cycle" - On Ometepe's wheel, Ometepe 'wins' (Zapatera throws the challenge). Redemption Island Ep. 4 RC/IC: "Toolin' Around" - Unties a hammer, Ometepe loses. Redemption Island Ep. 5 RC/IC: "Smoko" - Blindfolded Ashley follows Rob's directions, Ometepe wins. Redemption Island Ep. 6 RC/IC: "Beach Balls"- Makes no catches, but thanks to Grant, Ometepe wins. Redemption Island Ep. 7 RC/IC: "Crash Course"- Goes through the obstacle course, and Ometepe wins. Redemption Island Ep. 8 IC: "Rollerballs" - Second person out, in the two-ball phase (11th/12). Redemption Island Ep. 9 (F11) IC: "Meso Soup" - Eliminated in the first round (tie-7th/11). Redemption Island Ep. 9 (F10) IC: "Gang Hang" - Second-to-last to drop, letting Andrea win (3rd/10). Redemption Island Ep. 10 IC: "Mayan Pizza"- Eliminated in first round (tie-7th/9). Redemption Island Ep. 11 (F8) IC: "Log Jam" - Wins vs. Andrea in first round, loses to Grant in 2nd round (tie-4th/8). Redemption Island Ep. 11 (F7) IC: "Memory" - With Steve, eliminated on the 6th card (tie-2nd/7). Redemption Island Ep. 12 IC: "Step On It"- Gives Rob a good run, finishes third (3rd/6). Redemption Island Ep. 13 IC: "Bone to Pick" - Solves the world's easiest puzzle, and Ashley wins! (1st/5). Redemption Island Ep. 14 (F5) IC: "A Numbers Game" - Solves the world's 2nd-easiest puzzle. Ashley wins! (1st/5). Redemption Island Ep. 14 (F4) IC: "Meso Maze" - Almost topples Rob, settles for second (2nd/4). Redemption Island: None. Rob would not allow it. Redemption Island, Ep. 2: Matt Elrod (voted out, 4-2-). Redemption Island, Ep. 4: Kristina Kell (voted out, 4-3). Redemption Island, Ep. 8: Matt Elrod (voted out, again, 6-5-1). Redemption Island, Ep. 9 (F11 vote): Mike Chiesl (voted out, 6-5). Redemption Island, Ep. 9 (F10 vote): David Murphy (voted out, 6-4). Redemption Island, Ep. 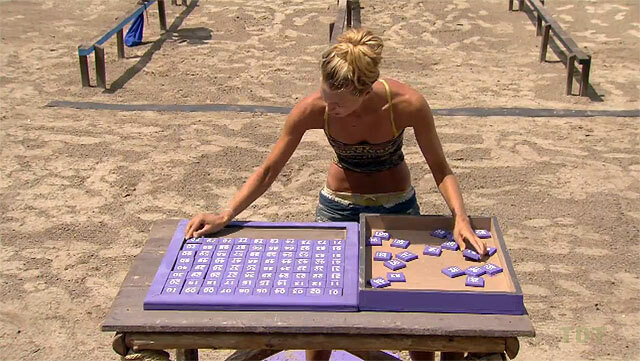 10: Julie Wolfe (voted out, 6-3). Redemption Island, Ep. 11 (F8 vote): Ralph Kiser (voted out, 6-2). Redemption Island, Ep. 11 (F7 vote): Steve Wright (voted out, 6-1). Redemption Island, Ep. 12: Andrea Boehlke (voted out, 5-1). Redemption Island, Ep. 13: Grant Mattos (voted out, 4-1). Redemption Island, Ep. 14 (F5 vote): Andrea Boehlke (voted out again, 4-1). Redemption Island, Ep. 14 (F4 vote): Three votes, from Rob, Phillip, and Natalie (voted out, 3-1). Redemption Island, Ep. 14: Voted for Boston Rob Mariano, who won (8-1-0). 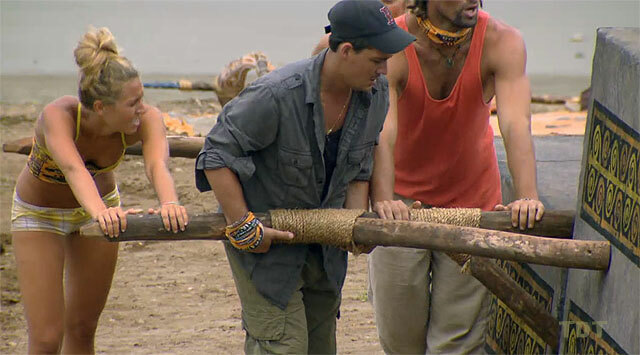 There has to be more to this challenge than what Probst just said, doesn't there? Wait, there was a 'Russell' on this season? Are you sure? The final four, ready for one last challenge. Listening to Probst, final 4 IC. Rob Cesternino at RHAP (5/16/11): "Andrea and Ashley"
SurvivorOz podcast interview (7/30/13): "Ashley Underwood Interview"
"Personal Claim to Fame: Spending time abroad in Switzerland, playing basketball professionally and competing in the Miss USA competition. Pet Peeves: I have a million pet peeves. A few of them are "know-it-alls," lazy and unmotivated people, slow drivers or movers in general, people that "chomp" when they chew their food, smokers' breath or just smoking period. The list goes on and on! Survivor Contestant You Are Most Like: I'm not like anyone but myself. Reason why you think you will be the sole Survivor: I'm mentally and physically strong enough to do this. I will do whatever it takes to get ahead. I'm a leader, but also able to work well with others if it proves to be to my own advantage. I'm not afraid to be a game changer. Bring it on!"